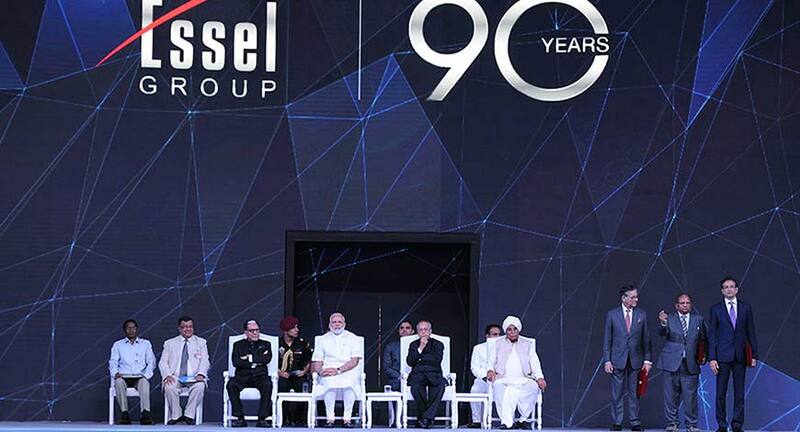 The Essel Group’s 90 Years Celebration event aimed at commemorating the Essel Group’s achievement of crossing the 90 year milestone and spanning 6 generations. The gala evening saw the presence of the Hon’ble President Pranab Mukherjee, Hon’ble Prime Minister Narendra Modi, esteemed Ministers, dignitaries, leading industry associates and partners. The event also served as a prime platform for Dr. Subhash Chandra, Chairman, Essel Group and Member of Parliament, Rajya Sabha to launch key initiatives viz. the DSC Foundation, Saarthi Initiative, the Zee Family Legacy Business Awards and Army Behind the Army. It was a rare occasion to see four living generations of the Essel Group comprising 41 people come together and stand side by side on one mega platform. The Who’s Who of the nation attended the grand celebrations including Shri Mulayam Singh Yadav, Shri Amar Singh, Shri Manoj Tiwari, Smt Smriti Zubin Irani, Shri Subrata Roy, Shri Jagdeesh Chandra, Swami Avdeshanad Maharaj, Gurmeet Ram Rahim Singh and Shri Vijender Singh to name a few. Percept ICE’s scope of work encompassed conceptualizing, planning and executing the entire event which included building a brand identity for the Essel Group’s 90 years and the social media handle of YoungAt90, designing the entire set, managing the Red Carpet, pre function area, lounges, stage, seating arrangements, protocol management, accreditations, hospitality, and managing the entire technical production of the show. Security arrangements were made in accordance with the Prime Minister and President’s office protocol and requirements. The event saw the use of the largest LED surface in a 360 format under one resolution, which helped to highlight the immensity of the show. The visual content for the show was designed completely by Percept ICE with the help of their Indian and international partners. The Legacy of Essel Group was woven in two creative audio visual presentations in the form of a poetry and prose, the voice of which was given by the legendary Mr. Amitabh Bachchan. The event was hosted by Sudhir Chaudhary, Chief Editor, Zee News. 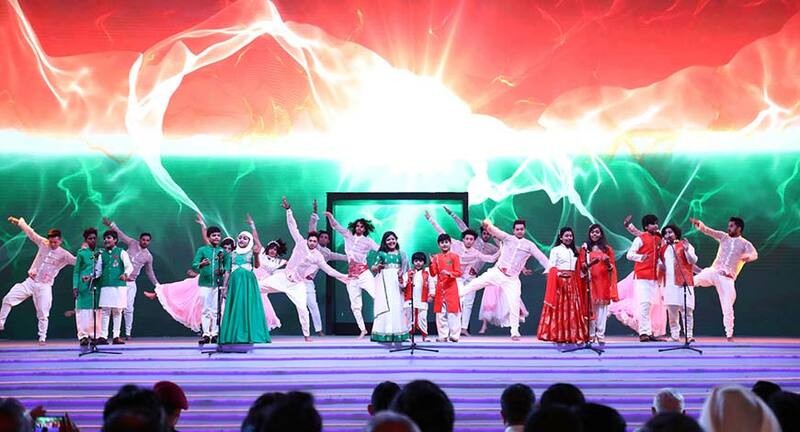 The event commenced with the Vande Mataram anthem performed by the SaReGaMaPa L’il Champs followed by a welcome memorandum from Mr. Ashok Goel. Several personalities delivered memorable speeches. Smriti Irani focused on the 25 years of Zee while Swami Avdeshanandji speech moved the crowd with his oration. The Zee Media Family Legacy Business Awards were announced and awards were handed out by the Hon'ble President Pranab Mukherjee. Dr Subhash Chandra introduced the upcoming English News Channel WION (World is One News) and the Saarthi Initiative aimed at becoming a bridge between the government, masses and the DSC Foundation. 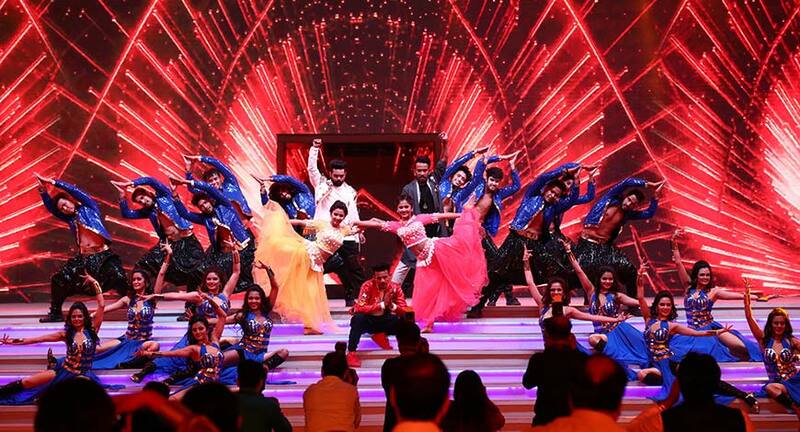 The event also included the performance by the winners of SaReGaMaPa and DID (Dance India Dance). The Hon’ble Prime Minister of India, Shri Narendra Modi described the program as an illustration of Indian traditions. He praised the family’s openness to new ideas, ingenuousness of tackling every challenge as an opportunity, and presenting a range of initiatives from “soil to satellite.” Appreciating the social initiatives of the Essel Group, the PM said that the Swachh Bharat Mission provided opportunities for a large number of social entrepreneurs to emerge. The Prime Minister urged the audience to work towards specific goals for the country by 2022 – the 75th anniversary of independence. The Hon’ble President of India, Shri Pranab Mukherjee congratulated the Essel Group on the completion of its 90 years and the launch of novel initiatives such as WION, Sarthi and the DSC Foundation. He appreciated the spirit of the celebrations ‘Young at 90′, and stated that one should always remain young and look at issues with a fresh perspective. He espoused on Technology’s disruptive impact on society and how it can be utilized well depending on how we intend to absorb and advance the same. The President concluded on the note that in another decade the Essel Group would complete its centenary and that they should remain young even at 100, and forever.